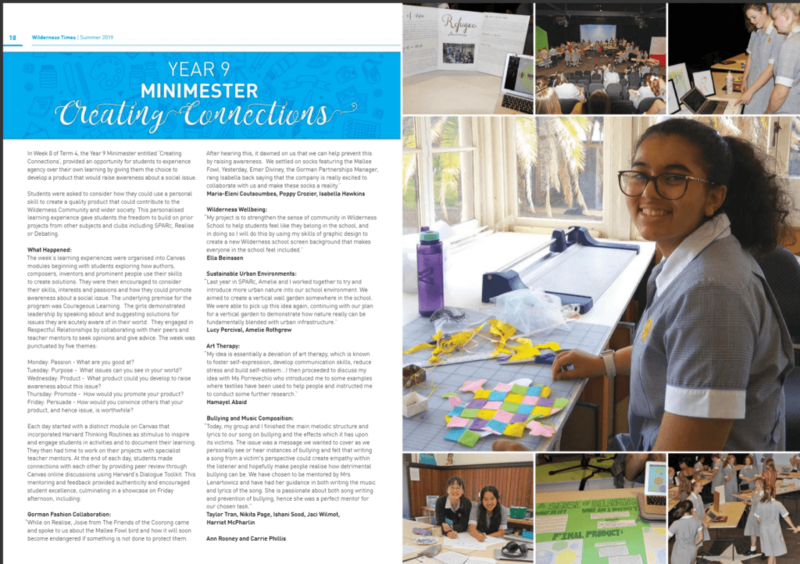 The Year 9 Minimester for 2018 was entitled Creating Connections. Similar to last year’s Minimester it was held during week 8 of term 4. At this time in the school calendar, the Year 9 students have completed their semester’s work and the Minimester provides a personalised, engaging learning program before the summer holidays. In contrast to the 2017 Minimester, the 2018 Minimester viewed entrepreneurial learning through the lens of student voice, passion and personal skill with the outcome of producing a product that would give back to society. The week ended with an exhibition for students to showcase their products to the school’s community. 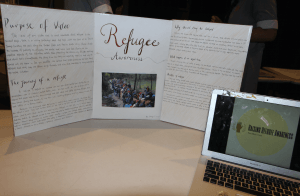 The Year 9 students were encouraged to use their skills, interests and passions to promote awareness about a social issue. Courageous Learning, was the underlying premise for the program. The girls demonstrated leadership by speaking about and suggesting solutions for issues they are acutely aware of in the world. They engaged in Respectful Relationships by collaborating with their peers and teacher mentors to seek opinion and give advice. To assist students to choose a teacher mentor the Year 9 teachers filled in a survey and the results were presented to students in a spreadsheet. The students found this part very exciting and over the week it provided many opportunities for teacher-student conversation about their personal passions and products. The PowerPoint below gives an overview of the learning programme. To see the resources of videos, readings and dialogue prompts, go to a copy of the 2018 Minimester Canvas site. Student discussions have been disabled for student privacy. The week was punctuated by five themes. Monday: Passion What are you good at? Tuesday: Purpose- What issues can you see in your world? Wednesday: Product- What product could you develop to raise awareness about this issue? Thursday: Promote- How would you promote your product? Friday: Persuade- How would you convince others your product and hence issue is worthwhile? The girls followed a similar process each day to reach their goals. 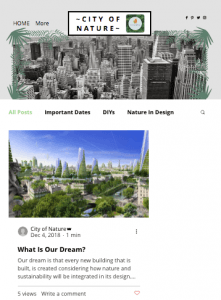 The online learning platform, Canvas, was used to direct students and provide stimulus including videos and articles to inspire their thinking and to keep them on track to achieve their goals. 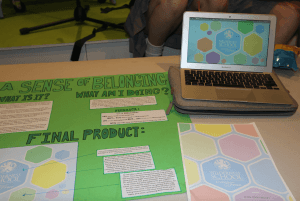 Students undertook research and engaged in activities to document their learning each day. Each afternoon, students had to make connections with each other and their teacher mentors who gave feedback via conversations, both in person and in Canvas online discussions. This feedback provided authenticity, encouraging student excellence. Wellbeing home page for the school. My project is to strengthen the sense of community in Wilderness School to help students feel like they belong in the school, and in doing so, improve their mental health. Since students will see this background when they first get their laptop, this will also help new-girls feel like a part of Wilderness. I will do this by using my skills of graphic design to create a new Wilderness school background that makes everyone in the school feel included. therapy, which is a commonly used method which enables people to communicate thoughts, fears or ideas in a way that verbal communication is sometimes incapable of. Art therapy is known to foster self-expression, develop communication skills, reduce stress and build self-esteem. 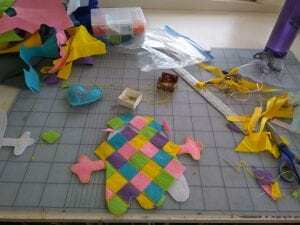 These benefits of art therapy would be beneficial for teenagers with mental health illnesses, and are generally transferable to any form of creative expression, including sewing. “Today, my group and I finished the main melodic structure and lyrics to our song on bullying and the affects on which it has towards victims of the abuse…The issue of bullying was a message we wanted to cover as it is so prominent in the society of today. We personally see or hear instances of bullying and felt that writing a song from a victim’s perspective could cause empathy within the listener and hopefully make people realise how detrimental bullying can be on one’s self. The repetition of the phrase “she says” refers to the hurtful words in which the bully has said to the victim. 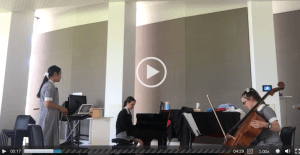 However, the end of the song takes a happy twist when the victim realises she is better than the bullies and gains enough emotional strength to “close her eyes and walk away” from the situation. Tagged Minimester, Year 9, Yong Zhao. Bookmark the permalink.